Liverpool Football Club are delighted to announce the signing of defender Dejan Lovren from Southampton. The 25-year-old Croatian international today put pen to paper on a long-term deal with the Reds after completing his medical. Lovren becomes Brendan Rodgers' fifth signing of the summer and the third arrival from St Mary's, following the capture of striker Rickie Lambert and midfielder Adam Lallana. Upon finalising his Anfield move, the centre-back told Liverpoolfc.com: "It's a dream come true. I'm happy and glad to be here. I'm proud and can't wait to start. I know we have millions and millions of supporters - Liverpool is more than a club. Dejan Lovren has revealed why he cannot wait to step out at Anfield and hear the words of 'You'll Never Walk Alone' once again after completing his transfer to Liverpool from Southampton today. The Croatian defender became Brendan Rodgers' fifth signing of the summer on Sunday, following the same path as Rickie Lambert and Adam Lallana in swapping St Mary's for Merseyside. Shortly after concluding the formalities of his switch with a medical at the club's training base, the 25-year-old sat down with Liverpoolfc.com for an exclusive interview about his move. Lovren discussed his joy at the chance to reunite with his aforementioned former colleagues, explained the emotions generated in him by the Reds' anthem and looked forward to working with Rodgers. Dejan Lovren - Liverpool player. How does that sound? It sounds amazing and it's a dream come true. I'm happy and glad to be here; I'm proud and can't wait to start. What are you most looking forward to about playing for Liverpool? I'm most looking forward to Anfield, of course. I played there last season in front of the crowd singing 'You'll Never Walk Alone'. That is something very special for every player, every sportsman and every fan. I can't wait to get started. What do you know about the club and its history? I know we have millions and millions of supporters - Liverpool is more than a club. You spent one season with Southampton - how do you reflect on that year at St Mary's? It was just one season and it was really short, but we had a great season with the team and it was amazing to play at St Mary's. It was the first time I had played in England and I was proud to play for Southampton. I'll take good memories from my time there. When you meet up with your new teammates, there will be a couple of familiar faces in Rickie Lambert and Adam Lallana - that must be a great feeling for you? Yes, of course, but it's not just Rickie or Adam, I also want to meet the other lads and I can't wait to start with them. They are top players and top lads. Of course I know Adam and Rickie a lot better from last season - they are great players and they deserve to be here. What do you think Rickie brings to this Liverpool team? He has a lot of experience, has played a lot of games in the Premier League and the Championship also. Rickie scored a lot of important goals last season and I learned a lot of things from him. He was like a leader for us. What can you tell us about Lallana? I really enjoyed playing with Adam last season - it was amazing. He was the main player, playing all of the games. Like Rickie, he is a great leader, even though he is only 26. Now the dream has come true and we will get the chance to play together. You scored just twice for Southampton, one of them the winner against Liverpool at Anfield last season. What did that moment mean to you? It was an amazing moment for me because before and after the game I sensed the feeling and atmosphere around the stadium. I will never forget the victory we achieved and especially getting the goal. After the game, I said to myself: "One day I hope I'll be able to play here for Liverpool." Apart from the goal, what else do you remember about playing at Anfield that day? Jose Fonte, my defensive partner at Southampton, told me to listen to 'You'll Never Walk Alone' before the first whistle and to enjoy the moment. It was really amazing - I had chills on my arms and it's something that I will never forget. I want to listen to that song every other weekend. What have you made of Brendan Rodgers' plans for Liverpool, in this coming season and beyond? We have spoken a little bit. Liverpool have already bought five players, so you can see the club has big ambitions to carry on and not stop here. Of course, I want to be part of the club's ambitions. What have you made of Liverpool's playing style under the manager? I like his style, it's amazing and quite similar to Southampton. Their games last year were great, particularly the win at St Mary's. Liverpool play amazing football so I can't wait to join up with the team. It is a privilege to be here. For anyone who may not have seen you play, how would you describe yourself as a footballer? I'm a defender but I don't really like to talk about my qualities, as I want to show them on the pitch. The fans will know from the first minute that I'm a player that will give 100 per cent on the pitch, who will really give everything for the lads. This summer you played in your first World Cup with Croatia - what positives did you take from the experience? It was an amazing experience for me as it was the first time I have been to the World Cup. I will never forget the opening game against Brazil; I don't know how many billion people were watching! But I'm obviously disappointed that we were eliminated after three games. That said, I think we have a quality team and quality players, so hopefully in the future we will do better. Back to here and now with Liverpool, what are your plans next? Are you going to join your new teammates in the USA? Yes, hopefully my Visa will be completed on Monday, so I can travel on Tuesday. It's important for every player that you are with the team in pre-season. Finally, what is your message to Liverpool fans? As I said, I'm a player that will give 100 per cent and I want to show that to the supporters because they deserve to see players who give 100 per cent. I know it is going to be something special to play in front of the fans at Anfield and I can't wait. Brendan Rodgers believes Liverpool have added additional power and leadership to their defensive ranks with the acquisition of Dejan Lovren. The Croatian centre-back has inked a long-term deal with the Reds to tie up his move from Southampton, and will jet out to the United States to join up with his new teammates on their pre-season tour. "This is a very important signing for us and I'm delighted it's completed so Dejan can join up with us on our US tour," Rodgers told Liverpoolfc.com. Welcome to the club, Dejan! Welcome to the club Dejan! 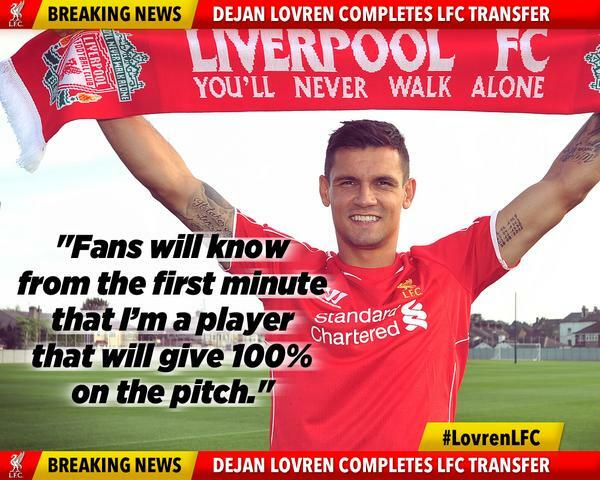 Welcome To Liverpool Football Club @DejanLovren05! So Diego gets this one...you were itching weren't you? Anyway, this is perhaps the most influential player we've added to the team. Leadership with dynamism and skill, this guy is who we needed. Seems to be saying the right things as well. A great signing. Top quality defender and we do need to defend better than last season. Hope he helps in getting our goals conceded tally down from last season. I just signed a contract with one of the biggest club in football history, the great #LiverpoolFC !! I'm already liking the cut of this fellas gib! ooh two threads, hope he helps us with our goals conceded tally from last season. The Powers That Be can f**k mine off scanned through and didn't see this one! Happy for him that he's got the move he wanted. Hope he performs well and it'll be interesting to see who he partners. Disappointing tattoos compared to Dagger and Skittles tbh. Welcome to LFC tho man! Fantastic. I actually think, despite all the moaning from some sources, that this lad will turn out to be a great signing. I'm basing that on nothing more than a few times I've watched (world cup) and instinct. There's something about this signing that feels right, could of course fall flat on it's face but I don't believe it will. Another signing Brendan clearly had as a high priority and that is good work by all involved. Finally got our main man for the back. Welcome to the greatest football family in the world. Boss signing. Was iffy at first connection with him due to the price, but he's an excellent player, and a fantastic attitude to have in that backline. Never enough space for players who love wearing our kit. Welcome to the club Dejan. Welcome Dejan. You're gonna love it here. Welcome Dejan! We'll love you and you'll love us! Think he'll be first centre back on the teamsheet. Think Toure'll be first centre back on the teamsheet. Fixed it for ya, mate... obviously haha! I agree though. Very good signing (made better by the fact he was Brendan's 1st choice!) and look forward to seeing him play for us! 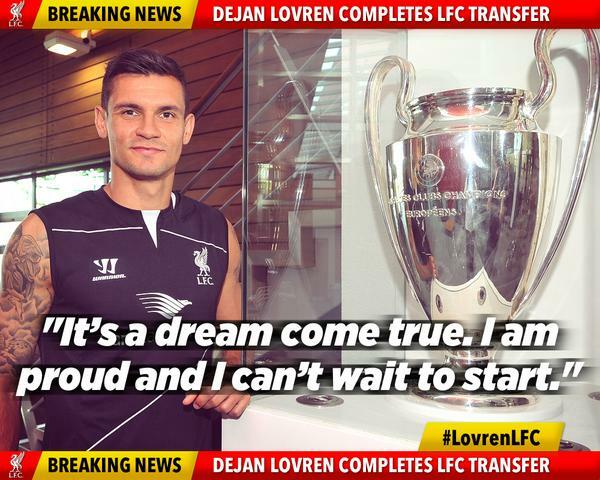 Welcome Dejan, just what we needed.